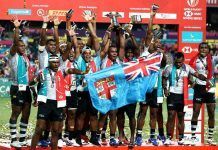 Fiji beat South Africa 22-0 at the Cathay Pacific / HSBC Hong Kong Sevens to claim their first tournament victory of the 2016-17 series. 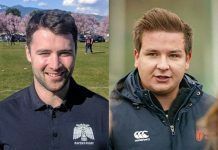 The Olympic champions scored four tries in the final as a weekend of pulsating rugby came to a thrilling close on Sunday. The result, the first tournament win under new coach Gareth Baber and their third consecutive win in Hong Kong, means Fiji jump to second place in the standings ahead of England while the Blitzboks remain on top with three tournaments left this season. 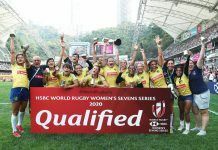 Meanwhile, Spain secured their spot on next season’s HSBC World Rugby Sevens Series after beating Germany 12-7 in the World Rugby series qualifier final at the Hong Kong stadium. Scotland won the Challenge Trophy while Australia claimed bronze after beating USA. Fans in the packed Hong Kong stadium rose to their feet as Fiji and South Africa ran out for the last game of the weekend, with Fiji searching for their first tournament win this season and the Blitzboks hoping for their first ever win at the Hong Kong Sevens. 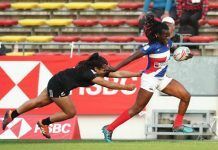 The opening exchanges were tense until captain Osea Kolinisau broke down field to set up Sevuloni Mocenacagi to score in the corner. The second try came shortly afterwards as Mesulame Kunavula bustled over after strong Fijian carrying to make it 10-0 at half-time. Neil Powell fired up his troops at the pause in play but it was the Olympic champions who struck first after the break, with Kalione Nasoko making a superb break to score underneath the sticks. Minutes later Nasoko struck again to seal the win and also take the HSBC Player of the Final accolade. Earlier on Sunday, a ferocious start by Fiji against Australia saw captain Osea Koliniseau race in for his 119th series try to open the scoring. Hot stepper Jerry Tuwai continued his impressive Hong Kong tournament as he slinked past the Australian defence before replicating his show-and-go minutes later. After that Nasoko finished a sublime Fijian move to make it 26-0 at half time. Tries by Charlie Taylor and Liam McNamara in the second half gave Australia brief hope, but a score by Setareki Bituniyata left it 33-12 and Fiji were on their way to an eleventh series final in Hong Kong. One of the first names on the Hong Kong dream team was Perry Baker and the speedy number 11 put USA ahead in their semi-final against South Africa. Siviwe Soyizwapi fired back for the Blitzboks before the Americans suffered a hammerblow as Danny Barrett limped from the field. Dylan Sage scored his second Hong Kong Sevens try shortly afterwards and captain Philip Snyman made it 19-7 to South Africa at the break. The Blitzboks restarted with another try from Soyizwapi, but then the turnaround came. Martin Iosefo crossed before Perry Baker scored two tries to level the game. Madison Hughes’ conversion was wide from the last try and so extra time was on. 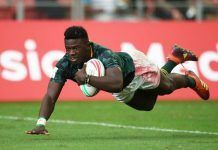 With large chunks of the crowd chanting for the Americans, the USA tore into the Blitzboks but the series leaders held their nerve and Ruhan Nel eventually broke through to score the match-winning try to leave it 29-24 in South Africa’s favour. The first quarter final of the day got off to a frenetic start with former Australian captain Ed Jenkins knocking on just over the try line before good counter rucking by Argentina set up Matias Osadczuk for the opener. Australia weathered pressure from the South Americans before a superb break by Boyd Killingworth allowed the men in gold level it at the break, 7-7.Dream teamer Henry Hutchison, who was so impressive for his side on day two, started his day with a try to put Australia in front before captain Tom Lucas ghosted through for a well taken effort to seal the win. A late consolation try for Argentina by Renzo Barbier was too late to make an impact as the match finished 21-12. Vatema Ravouvou started where he left off on day two as he got Fiji out of the blocks with a well taken try but Canada, who looked sharp all weekend, equalised with a try from Luke McCloskey in the second quarter-final. That momentum benefitted the Canadians and Lucas Hammond put them in front as he burrowed his way over the line. But this being Fiji and this being is Hong Kong, the Olympic champions fired back through Kalione Nasoko to make it 12-12 at the break. Ravouvou scored again just after the resumption of play and Nasoko got his second before Fiji went coast-to-coast to put over Sevuloni Mocenacagi to progress to the semis with a 29-12 win. Two of the tournament’s unbeaten teams faced off in the third quarter-final of the day and USA brought the fight to England. Tom Mitchell got the scoring underway early for the English, but tries from Madison Hughes, a beautiful rip-and-run from Perry Baker and Stephen Tomasin had USA ahead 15-7 at half-time. The American momentum continued in the second half as Ben Pinkleman crossed to increase the lead. A sustained period of English pressure failed to result in points and captain Hughes broke away to score and end a breathless encounter, 27-7. The noise levels in the Hong Kong stadium were high by the time series leaders South Africa took to the field against New Zealand. Chris Dry opened the scoring for the Blitzboks after a sustained period of pressure, but that was cancelled out by Regan Ware’s 25th series try for the All Black Sevens. South Africa’s Dylan Sage sin-binning for a high tackle allowed Sione Molia dot down before the half time whistle. After the break, Cecil Afrika, on his 50th tournament appearance, scored in the second half to inspire his team and hard work resulted in Werner Kok crossing to ensure the win. 21-19 it finished, with South Africa through to yet another series semi-final this year. 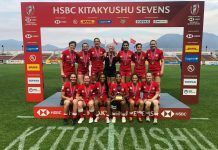 It’s hard to fathom that a year of preparation all boils down to 14 minutes in Hong Kong, but that’s how it goes and Spain and Germany took the field on Sunday evening, knowing that a place on next season’s HSBC World Rugby Sevens Series was on the line. A tense opener saw Fabien Hempel cross for Germany after a period of pressure but Javier Carrion’s line break saw him make up the gap to leave it 7-5 at half-time. A beautiful break from Pol Pla saw Francisco Hernandez cross for a well-worked try in the second half and despite Germany’s attempts, Spain held on for a deserved win. Chile and Germany both impressed over the three days in Hong Kong and a tough battle in the first half of the first World Rugby series qualifier saw Germany edge 14-7 in front at half time. 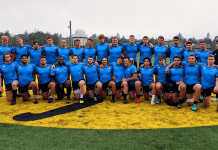 While the lineouts didn’t function for Germany in the second half, mistakes by Chile gave them opportunities and try by Raynor Parkinson helped them progress to the final with a 19-7 win. In the other semi-final, Spain scored in the first half through Inaki Villanueva against Papua New Guinea before tries in the second period by captain Angel Lopez and Igor Genua completed the job for Spain. Late scores from Wesley Vali and William Tirang offered only consolation for PNG. The 16 series teams travel to Singapore for the eighth round of the HSBC World Rugby Sevens Series next weekend, 15-16 April.